This page is about the aircraft F2A-1. For other uses, see F2A (Family). The F2A-1 Buffalo is a Rank I American naval fighter with a battle rating of 2.0 (AB/SB) and 2.3 (RB). It was in the game since the start of the Open Beta Test prior to Update 1.29. The Brewster F2A Buffalo was the first carrier based monoplane of the US fleet, made to replace the outdated biplanes in service with the US navy. It had a 950 horsepower engine and a total of four machine guns. The nose armament consists of two machine guns of different caliber, a 0.50 caliber (12.7 mm) and a 0.30 caliber (7.62 mm). Each wing is also equipped with a 0.50 caliber for two more machine guns. Many countries ordered the Buffalo, including the Finnish Air Force which was highly successful with the theirs against Russian fighters. But by the time WW2 started, and the attack on Pearl Harbor, the F2A was outclassed by the Japanese A6M2 and Ki-43s. The F2A-1 is a competitive machine, if using the proper tactics versus the proper enemy. The Buffalo can outrun biplanes and can out-turn most monoplanes. 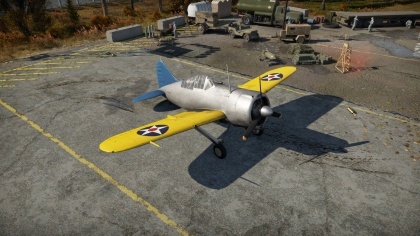 This plane will get a pilot used to the American style of playing using Boom & Zoom, and armaments of .50 caliber machine guns. The best way to fly this aircraft would be as a Boom & Zoom or energy fighter; it can outrun most aircraft it faces, unless it is uptiered and faces something like the Bf 109 F-1. In such a scenario the best way to destroy more advanced vehicles is through boom and zoom tactics. In Arcade, there is no need to worry about ammo count as much as in Realistic Battles (RB) and Simulator (SB) since the planes can reload in the air. The target-lead indicator, which shows approximately where there enemy plane will when when the bullets reach the target, also eases with aiming. For arcade, the ammo belts are really useful, it is suggested to use Omni purpose ammo for the .50 calibre (12.7 mm) machine gun and stealth for the .30 cal (7.62 mm) machine gun, however another option is to try going all stealth so the F2A can surprise the enemy with bullets they can't see. There are a variety of enemy planes that the F2A-1 faces, ranging from biplanes to low rank monoplanes. In the common low rank arcade battle we get fur-balls going on at low altitude with planes trying to get on each other's tail, a perfect set up for a Boom & Zoomer like the Buffalo, first set the attack angle, which could be from directly above the enemy that is targeted, or from behind (it should be priority to target enemy planes that are chasing friendly planes or for a dangerous threat like, MiG-3s, LaGG-3s, Hurricane, Bf 109s or another Buffalo). Once the F2A is nearing towards the enemy plane, know what type of enemy they are, depending on what plane they are flying, is what determines what to do after an attack run. Lets say with a dive on an enemy, but the attack didn't destroy them on the first pass, if the enemy was a biplane, then keep up the speed and vacant the area, and set up another pass. If the enemy was a monoplane in the same situation, the F2A can choose to either clear the area, or turn onto their tail, but it is advisable to leave the area and look and see if the enemy noticed the attacking F2A, if he didn't and he is chasing a friendly or going for ground targets then latch on to his tail and shoot him down! In Realistic Battles & Simulator Battles, most of the tactics against fighters would be the same as in arcade, only with a few restrictions. Do not dive too fast, or the F2A wont be able to pull up or the plane's wings will break. No Enemy-Lead indicator, pilot skill and intuition will have to guess where the enemy plane will be when the bullets reach the targets. Very limited ammo, on top of that the armament isn't reliable outside of 400 meters. So how does one play this in RB with all these draw backs? A few very simple things will help with those problems, at the beginning of the match in RB, climb at about a 15 degree angle until about 3,000-4,000 m in altitude. When an enemy is spotted, if a biplane the F2A will have to take up a Boom & Zoom tactic, do not attempt to turn fight. If the enemy is a monoplane, turnfighting can be a valid tactic; unless they are the British Hurricane or Japanese A5M (not to confuse with A6M much superior to the Buffalo) or Ki-43, then do not turn fight these monoplanes. For the most part, Russian monoplanes are safe to turn fight (I-16s, late I-16s, MiG-3 and LaGG-3s). When diving on an enemy, put the throttle to 0% so the F2A does not accelerate too fast. If a shot can't be gained on the enemy, pull out by putting throttle at 100% and point the nose up to gain altitude. Once on the tail of an enemy, no matter the plane, open fire only at close ranges, firing at 300 meters or less would help conserve the ammo and there won't have to lead as much, therefore easier to aim and make each shot more effective. This can apply to all three game-modes: When someone is on the F2A tail and bullets fly past the plane, with the right altitude, make a short steep dive. With that little dive, it can dodge enemies bullets and it gives an opportunity to take a look back at the offending enemy. If the aircraft is a biplane, continue the dive and get out of range of their guns. 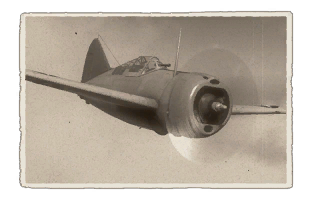 If it is a monoplane, attempt to turn fight, but the F2A is still effective in diving away from even faster monoplanes, which will be effective against maneuverable monoplanes like the Hurricane and A5M4. Learning the gun sounds also helps, sometimes the sound will help identify the enemy plane so as to make a move more instinctively. The Brewster F2A-1 buffalo was designed to replace the Grumman F3F biplane fighter. In a competition between the Grumman XF4F1 and the XF2A-1(the P35 lost early on), the XF2A-1 won as it was more advanced than the Grumman aircraft, so it went into production as F2A-1. Although the F2A buffalo fought only a few battles with the US Military, it fought important ones. In the battle of Midway it was one of the main fighter planes of the US fleet (the other being the F4F Wildcat), it played an important role(along with the other planes)in the battle of Midway, and showed that the F2A and F4F where no match to the A6M, and where soon replaced by more advanced F6F and F4U Corsair. Many Nations acquired the F2A in there air forces, the most successful country with the type was Finland. From January to February 1940, the Finns received there F2A-1s (Designated B239), in total they received 44 Buffalos. During the Continuation War the Finnish Air Force was highly successful with the type, they developed tactics that the Russians couldn't counter. One tactic they used was baiting, where 2 Buffalos are low and act as bait, as 2 others dive on attacking enemy planes. In the Continuation War, Squadron 24 of Finland, some sources state, had a victory ratio of 26-to-1. Buffalo's of 24 squadron claimed 477 confirmed kills to 15 Buffalos destroyed.